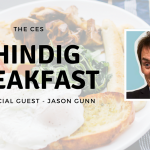 SAVE THE DATE for the CES Shindig Breakfast! ? The breakfast is always great fun and gives us a chance to say “thank you” for the work you give us during the year. It’s always a pleasure to give back to our valuable clients and a fantastic way to start the day. It’ll be breakfast at Gunn point! We’re really excited to have media personality and all-round good bloke Jason Gunn as our special guest this year. Invitations will come out later this term with more information. Keep an eye out for them! Be great to see you there. Previous PostLower North Island School Administrators' Conference - Last chance to register! ?